This section covers all issues related to Graphics in TV productions for orienteering. 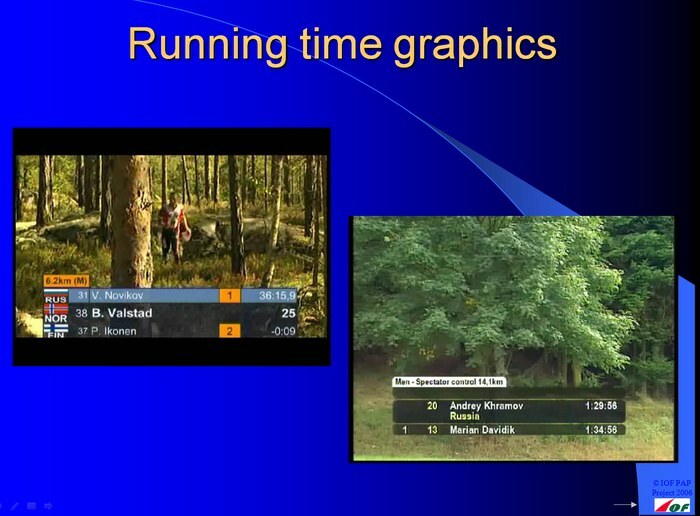 A section discussion "Best practise" for use of Graphics in TV productions for orienteering has been set up. This section will evolve during the project based on input from different sources. It must always be clear from the graphics where in the course camera footage is located. TV Split X (where X=1, 2 ....) is a good way to show it. Usually done, but not always. Show runner name with rolling time while camera is waiting for top runner (new leader) up to TV split to add to the drama. Needs spotter / pre-warning split for this to work. Basic info about the runners should be available when required, e.g. at the start when the runner is presented, during GPS tracking, etc. TV graphic layout should be set in Guidelines/Production manual. Possible solution must be clear and described in Guidelines: Which data must be shown for start, splits and finish and how must it be shown. The following screenshot is from the IOF Arena Production Presentation where graphics is handled to some degree. This topic is not discussed further in the current document. This is written under Pre-producer material - see Pre-produced_material#Runner presentations. GPS data can also be used as part of the pre-warning system. Note the delay of 15-30 seconds of GPS-data. The possibility to build a dedicated "decision aiding system" for producer / graphics producer based on a combination of available split times and GPS data should be evaluated. The system should be trained to show a queue of recommendations about which runner to show "in X seconds" based on all information available. This page was last modified on 8 February 2012, at 23:56.